Melanoma is a fast growing skin cancer which starts in the pigmented skin cells (melanocytes). A melanoma can develop as a new mole, or mutate an existing one. As it evolves it can enter the bloodstream or lymphatic system, leading it to spread to the rest of the body. While melanoma is not the most common type of skin cancer, it is the most serious. It is diagnosed by stage, this ranges from 0-4, with 0 being the least severe. When caught early melanoma can be treated and has a good cure rate. If it reaches stage 4 this means it has spread through the body, making it very difficult to treat. Every 5 hours someone in Australia will die of the disease. The main cause of melanoma is UV rays, and due to our harsh summer climate Australians are at an increased risk. Sun exposure and solariums are the biggest culprits, however in rare cases a melanoma may appear without any type of exposure. Anyone who spends time in the sun has an increased risk of melanoma and other types of skin cancer. However, those with fair skin and a history of sunburn have to be extra careful. Melanoma can occur at any age, and in this country 1 in 24 women, and 1 in 14 men will have a melanoma diagnosis in their lifetime. We recommend being vigilant when it comes to your skin. This means taking note of any changes, such as the appearance of new moles or differences in old ones. Bleeding, itching, asymmetry, blurred edges, unusual colour patterns, and growth (anything larger than a pencil eraser) are all signs to look out for. Melanoma is most often found in sun exposed areas such as the legs, face, ears, arms, shoulders and chest. The stage and the location of the skin cancer will play a bit part in whether or not it can be effectively treated, and this is why early diagnosis is so important. The first step is generally surgery, and for more severe cases chemotherapy or radiotherapy may be recommended. Adequate sun protection is the best preventative measure you can take. 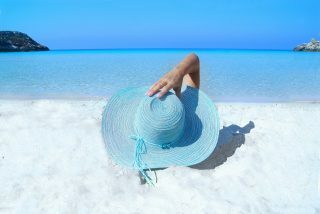 Change your routine to include sunscreen, wear a hat, long clothing and sunglasses. Be conscious of the time of day you spend outdoors, and always try to find a shady spot. Solariums are no longer legal in Australia, and should be avoided. If you notice something unusual a full body skin and mole check will give you peace of mind. We can flag any area of concern and if anything does look suspicious we will investigate for you. We recommend regular skin checks, as well as at home monitoring. Call us today to book an appointment at one of our clinics.